The meaning of the Shikon Jewel is that of Four Souls, but how did it become its current form and why is it able to make demons powerful? In the cave in the village of demon slayers, there’s a mummy of a priestess. She died a few hundred years ago from fighting demons. A gigantic demon awoke from the presence of the Shikon Jewel! Next episode, "Finally Revealed! Secret of the Shikon no Tama"! People who think like that will be thrown out of the cave…like that. It’s Midoriko’s version of "sit!" Sango agrees to join the group, and hence INU-gang is complete. When the group was moving towards the village of the demon exterminators, Kagome didn't have her bicycle. But in this episode, it appears in the village again. Sango seems to be the first pretty girl that Miroku doesn't hit on or asks to bear his child immediately. …Kagome actually brought washing powder over to the Feudal age for laundry? "I don't understand at all..."
…Shippo making a 'I love you' handsign when he keeled over all confused after Miroku's speech? At the end of the episode, Midoriko was shown with her vassal, a two-tailed cat like Kirara. It is highly impossible that Kirara was her vassal, but that two-tailed cats make very good combat comrades. 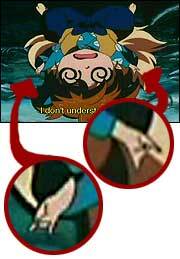 Hence, it elevates Sango’s ‘status’, that she actually had a two-tailed cat that is so faithful to her. Daytime in the village of the demon slayers. KAG is washing some clothes in a wooden tub. Cut to SHI and MYO exploring the storeroom. SHI: (picks up a weapon almost as big as him) So many kinds of weapons! All made from the bones and hides of demons! MYO: With these arms, the people of this village slew demons. SHI: So there are strong humans, too. MYO: That's why demons despised this village. MYO: Precisely, he set the demons upon this village. Cut to flashback from episodes 24 and 25, when the slayers fought the spider demon and when INU-gang fought a NAR puppet. KAG: (narrating) On our journey in search of Sacred Jewel fragments, we came upon a village of Demon Slayers said to the birthplace of the Sacred Jewel. Naraku's treachery had reached this spot as well and the entire village had been annihilated. Every Slayer except Sango was killed. The Sacred Jewel which Kikyo had tried to hide from the world… The Sacred Jewel which eons later burst forth from my body… In this village, everything would become clear. Cut to image of the Sacred Jewel. In the village. MIR is burning something. INU runs to MIR with a log slung over his shoulder. INU: Damn it! What's going on anyway?! Hey, Miroku! Is that Sango still in bed? INU: Well, get her up! She knows Naraku's whereabouts! (throws the log into the fire) She says she can't remember the castle where Naraku is staying! But if we keep looking, she's bound to remember! INU: So what?! We've been waiting now for ten days! A wound like that…I'd be up and around in three days! MIR: I would probably take to bed for a month. Besides, Sango suffers not only from physical injuries. She lost her entire family…the wound to her heart goes deep. INU: A wounded heart, huh? The best cure for that is vengeance! And for that, we have to find the castle where Naraku is staying! (excited) Awright! I'll go and ask her! MIR throws a log at INU. INU: Owwee! What're you doing?! MIR: Let her be for a while. That's the best medicine. KAG walks into a hut with her medicine box. The bed in it is empty. SAN sits at the burial mounds. KIR sits next to her. She meows and SAN pats her. KAG runs to SAN. KAG: Sango! Should you be up? You still need to rest. SAN: You buried everyone and marked their graves. KAG: Uh-huh… Umm… Uh… (thinking) I can't tell her to cheer up. In one short day, she became all alone in the world. (kneels next to SAN) When your wound heals, won't you come with us? Inuyasha and Miroku are basically good people. What do you think? SAN: You…had a fragment of the Sacred Jewel. KAG: Huh? (looks at her necklace) The fragments of the Sacred Jewel energizes the power of evil… It's far from its original shape. SAN: Naraku will come after it. All right, I'll come with you. KAG: You intend to avenge your family and village? KAG: Born in this region. We came to this village wanting to know more about that. (thinking) Everyone who comes in contact with the Sacred Jewel fragment becomes unhappy. Just what is the Sacred Jewel? KIR looks at KAG and mews. KAG: (pats KIR) What is it, Kirara? SAN: Call your friends. You helped bury the dead. I'll tell you…how the Sacred Jewel came to be. Everyone gathers in front of the cave. INU is piggybacking SAN. MIR: At last, we'll be able to enter this limestone cave where the Sacred Jewel came to be. INU: So Sango, just how do we get rid of this barrier? SAN: There's no such incantation. MYO: (harsh) Huh? Then how?! SAN: This is a graveyard. SAN: It's useless to just look for ways in. At first, we all thought that the demons had placed a curse to keep anyone from entering. But it seems that she is the one who keeps intruders out. SAN: The person from whom the Sacred Jewel was born. Her sadness and regret keep people from entering. That's what I sense. It'll be easier to understand if we go in. Go ahead, enter. INU: Ahh… (walks, pauses and looks at SAN) Are you sure? SAN: Until now, countless people have become victims of the Sacred Jewel. You sympathize with them, so I'm sure she will allow you to enter. The group walks through the barrier and stops. SHI: She's right. We got through. MYO: (still outside) We did it! Now we can meet this person who gave birth to the Sacred Jewel! Enter Myoga! (shocked by the barrier and thrown back) W-why?! The group walks into deep end of the cave. Carcasses of demons are strewn around the area. SHI shrieks. Everyone looks up in awe at a tall pile of bones in the middle. SAN: Demons, dragons and spiders all merged into one to wage a battle against one single human. INU lets SAN down and KAG holds her. They sit down. KAG: There's a mummy inside the stalagmite! A stone-like woman is seen in the stalagmite. MIR: The demon has her in its jaws… An ancient armor… A warrior of long ago? SAN: It's a woman. A priestess from several centuries ago. INU looks at it in silence. MIR: But look at the number of demons surrounding her. This priestess must have had immense spiritual power. SAN: The court nobles controlled power at that time. Wars and famine dragged on and on and countless people perished. By devouring the dead and the near-dead, demons grew in number. Many priests and warriors set out to slay them but one priestess known as Midoriko was able to purify demons' souls and render them harmless. She ranked the strongest of them all. KAG: She was able to purify the souls and weaken the demons? SAN: Yes… In this world, humans, animals, trees, and stones alike, all are created through four souls. KAG: (thinking) Four souls? Shikon? MIR: I've come across it in my readings. The four souls are namely: Aramitama [荒], Nigimitama [和], Kushimitama [奇] and Sakimitama [幸]. Combined they become the soul of one person…housed inside the heart. Cut to image of MIR in prayer position. MIR: (narrating) Aramitama governs courage [勇]. An image of INU floats in. MIR: (narrating) Nigimitama governs friendship [親]. An image of SAN floats in. MIR: (narrating) Kushimitama governs wisdom [智]. An image of KAG and SHI floats in. MIR: (narrating) Sakimitama governs love [愛]. MIR: (walks to the stalagmite) When the four souls work properly in harmony, it is called Naobi and the human heart is filled with good. Inuyasha, do you follow me? INU: (blushes and stutters) W-what?! SHI: (falls back with twirly eyes) I don't understand at all! SAN: When one does bad deeds, the four spirits energize evil and the human loses his way. MIR: In other words, with both humans and demons, the soul can turn good or bad. SAN: Midoriko must've been a formidable foe to the demons. She was able to purify the souls of demons and make them powerless. INU: (unimpressed) She fought off an army of demons, but her powers didn't last. Just means that this Midoriko wasn't much of a priestess. SAN: She hasn't lost the battle yet. SAN: After battling for seven days and seven nights, a demon got its fangs into Midoriko. With the last ounce of her energy, Midoriko seized the demon's soul, took it into her own soul, and forced it out of her body. MIR: The spot where she forced out her soul, is that the hole in her chest? SAN: What she forced out was the Sacred Jewel. She wasn't able to purify the demon's soul. All she could manage was to seize the demon's soul. Although the flesh is gone, inside the Sacred Jewel, a battle still wages between the souls of Midoriko and the demons. That is why this fight isn't over yet. KAG: Inside the Sacred Jewel…a war still rages on? INU is thrown up, through the barrier, out of the cave and over the trees suddenly. MIR: People who think like that will be thrown out of the cave…like that. SHI: It's Midoriko's version of "sit!" Sunset in the village. KAG is taking down the laundry. SHI and MYO have a conversation near KAG. KAG: It's gotten so late. MYO: A priestess inside a stalagmite? Tell me in detail, Shippo. SHI: The priestess thrust the Sacred Jewel from her body…the demon had her in its jaws…and they are set in stone. MYO: Hmm… Covered in stalagmite… Then as Sango mentioned, several hundred years have passed. Nighttime in the village. INU sits on the roof on a hut, while the rest gather inside. SAN: I believe it has something to do with Midoriko…but the villagers worked as Slayers for generations. Over the centuries, the Sacred Jewel passed through the hands of various humans and demons. And it returned here, during my grandfather's time. It came out of a demon that he slew. But his life and many others were sacrificed in the fight. Cut to image of the Sacred Jewel glowing in red. SAN: (voice-over) The Sacred Jewel which was removed from the demon was horribly defiled and beyond the abilities of the Slayers to handle. The screen fades and the jewel appears in a pair of palms. Zoom out to reveal a group of slayers bowing to KIK in front of a shrine. KIK holds the Jewel in her hand, nods and clasps it to her chest. Cut to present. SAN: (looks at MIR) Kikyo… I heard of a priestess so named who was able to purify the Jewel. MIR: Naraku learned about her and killed her. SAN: When demons and evil men possess it, the Jewel becomes defiled. When a pure-hearted human possesses it, the Jewel becomes pure. It's very complicated. KAG is patting SHI to sleep, listening in to the conversation gravely. Cut to INU lying on the roof. MIR: (loud) Inuyasha! Do not think about using the Sacred Jewel to become a great demon! INU: Keh! (thinking) First, I'll kill that Naraku! That's first and foremost. A while later. Everyone is sleeping with fresh sheets. KIR sleeps next to SAN. She wakes and sniffs the air. Cut to KIR walking out of the hut and sniffing the air. Inside the cave. KIR runs into the deep end with the Sacred Jewel necklace slung over her neck. She stops in front of the stalagmite. She scratches herself and MYO jumps out. MYO: Good! Kirara…my thanks. We made good time coming here. Midoriko… I, too, feel compassion for humans. However, when one lives long and sees so much death, one becomes accustomed to it. Cut-scene of MYO offering flowers and joss sticks in front of the cave. MYO: Forgive me. This afternoon, I was too eager in my pursuit of truth. Since you've allowed me past the barrier, I guess you understand. (KIR mews) Oh, sorry, sorry! I will be finished here soon. MYO packs the Sacred Jewel fragment into his sack and slings it over his bag. He climbs up the stalagmite. MYO: (praying) Namu amida butsu… So many demons… A single priestess took on this many demons? Unbelievable. Many of the demons merged with others into huge ones. So that's the hole in the chest where the Sacred Jewel was thrust out. Judging from the size, it's possible that the Jewel was thrust out from that spot. The sack falls off MYO's sack and the Sacred Jewel fragment flies out. KIR growls in apprehension at the shaking. Red orbs of light suddenly appear. MYO: Damn! It's the power of the Sacred Jewel! Demons who were not completely subdued are trying to revive! The orbs fly towards MYO and he shrieks. KIR growls and transforms to her fierce form. In the village. INU and MIR rush out. INU: What was that tremor?! KAG: (runs out of the hut) Inuyasha! The Sacred Jewel is gone! MIR: Something's happening in Midoriko's cave! MIR and INU run off. SHI: (walks out) Old Myoga is missing. Kagome, where's he, you know? INU: Maybe he went with Inuyasha? SHI: No way! The old one wouldn't stick his nose into danger! Old Myoga, where are you?! SAN: (looks around the room) Kirara? In the cave. KIR is trying hard to dodge the flying orbs of fire. MYO: (on KIR) Kirara! Run! Call Inuyasha and Miroku! (KIR runs to the stalagmite) What's the matter, Kirara? I see! We must get the Jewel fragment back! The dragon like demon that bit Midoriko wakes. Its long body coils around KIR and squeezes. KIR growls and faints. The head of the dragon growls. MYO: Demon spirits! They're transforming into fierce ones! KIR wakes, growls and faints. MYO: Hang on, Kirara! (thinking) Just won't do at all! The dragon head move towards MYO, who looks on in apprehension. Suddenly a light glow appears. The spirit of Midoriko wakes from her stone body. Midoriko leaps into the air with a sword in her hand and slays the dragon. A loud explosion is heard. Fade to KIR landing. Midoriko lands slowly. She gradually fades to Inuyasha. KIR and INU lands. MIR runs past INU. INU finds MYO among the fur, cowering. MYO: (waves his hands frantically) Oh, Master Inuyasha! (wipes his sweat) Oh dear… Thank goodness nothing happened. INU: Cut it out, will ya! Why'd you bring the Jewel fragment into a place like this?! KIR turns around and growls. MYO: Err…no… The souls which still lingered reacted to the light from the Sacred Jewel and tried to revive. I kind of expected it. INU: How can you brush it off so lightly when you almost died? You're so smooth with your talk! (scoffs) I shouldn't have saved you. MYO: W-what? When was I saved by you? MYO: I'm not acting dumb! I was saved by Priestess Midoriko! KIR walks to the stalagmite and looks at Midoriko. She settles down to sleep under her. Cut scene of Midoriko in a field under a wide cloudy sky. KAG: (voice-over) Old Myoga who investigated the story of the Sacred Jewel feels it was impossible for one priestess to battle so many demons, no matter how strong her spiritual power. A two-tailed cat exactly like KIR in her fierce form fades in next to her. Sango the demon slayer agrees to join us and hence we set off on our journey. Maybe I’m wrong, but I feel that Miroku is rather happy about this. This time, we arrive in a village plagued with floods. The Water God demands live sacrifices. Why would a god be this evil? But to prevent floods, the villagers obediently hand over their children. This may be the work of a demon with Sacred Jewel! Next episode, ‘>The God of Water who Governs the Lake of Darkness’!